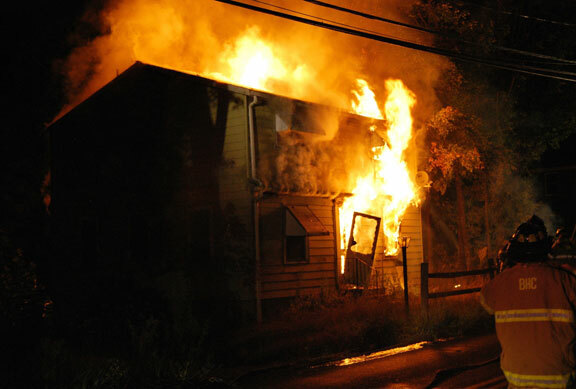 BEACON FALLS — An early morning fire destroyed a vacant single-family home on Beacon Valley Road. Beacon Hose Company No. 1 responded to a structure fire at 127 Beacon Valley Road near the Naugatuck border at about 3:15 a.m. Tuesday. The two-story house, which was unoccupied, was fully engulfed by the time firefighters arrived on the scene, Fire Chief James Trzaski said. Firefighters established a defensive exterior attack and extinguished the fire in about an hour, Trzaski said. About 25 firefighters responded to the scene and the Naugatuck Fire Department responded with a ladder truck to provide mutual aid, he said. Seymour Citizens’ Engine Co. No. 2 provided coverage at the firehouse in Beacon Falls, Trzaski said. No one was injured and firefighters were on the scene until about 7 a.m., Trzaski said. The house was a total loss, he said. According to property records, the house is owned by John D. Daisey. State court records show that a bank moved to foreclose on the property in 2013. A judgment was entered against Daisey in June and the debt on the home was noted at $298,701. Town records show the appraised value was about $181,000. The state police Central District Major Crime Squad and the state fire marshal’s office are working with the town fire marshal’s office to investigate the fire.